Our next meeting will take place on Saturday 10 December from 11am at Tapuhi, Hukerenui. Directions will be sent to members with the meeting agenda. This is our Christmas meeting so it’s primarily a social occasion. The meeting will be very brief. Please bring a plate to share. Please choose an entertaining (and brief) piece of writing with a Christmas theme to read aloud. This could be a poem, a short excerpt from a story, or a children’s picture book. Several NZSA Northland members have recently completed the NorthTec Applied Writing Programme’s ebook publishing course: Kath Wynn published Back to Binda, Wendy Megget The Little Bullying Book, Janine McVeagh The Trouble with Water and Lesley Marshall published Di Menefy’s short story, Brush Strokes. Di Menefy published River Crossing and Justine Payen published Forming a Picture of You, poetry by herself and Kevin Baddeley. These books will be featured in the next PenNorth. Trish Nicholson has published a new book – a non-fiction cultural history: A Biography of Story, A Brief History of Humanity. It will be released in the UK in March 2017 and can now be pre-ordered on discount from the Book Depository. There is more information on Trish’s website. Jac Jenkins’ poem, ‘Paper Doctor’ has been published in the 2016 NZ Poetry Society anthology, Penguin Days. Jac has been accepted into the University of Victoria’s Master of Arts in Creative Writing programme. Our featured book this month is Spitshine by Michael Botur. 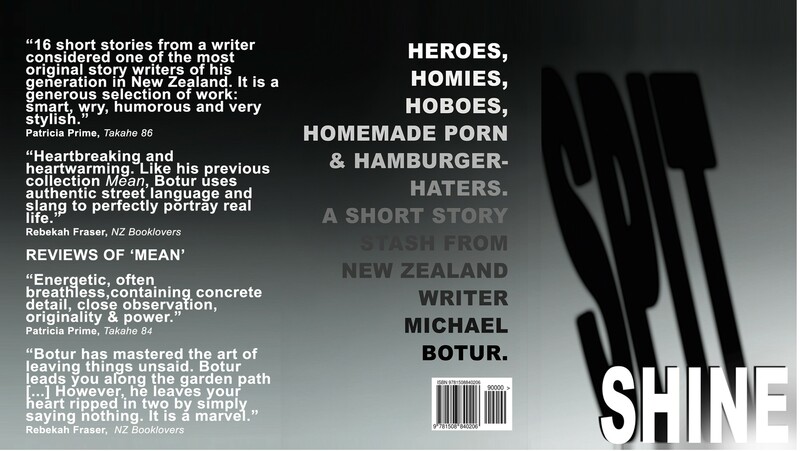 Spitshine is the third fiction collection from NZ writer Michael Botur. Spitshine is 16 gritty short stories about people who will do anything to get on top. The genre is literary fiction and the stories are in the tradition of NZ writers Alan Duff, Chad Taylor and Bill Payne. The stories in the collection have been published in literary journals including The Red Line (UK), Newfound (US), Takahē (NZ) and Swamp (University of Newcastle, Australia). Some have won or been shortlisted for prizes. Michael Botur has published fiction and poetry in Landfall, Poetry New Zealand, Takahē, Bravado, Catalyst, Deep South, 4th Floor and JAAM. He works in corporate communications in Northland. Previous fiction collections MEAN and Hot Bible! are available at amazon.com.